One of my besties is on a well-deserved vacation. It is her first extended vacation away in two years from being a full-time caregiver to her parents who she loves so dearly and takes such wonderful care of. In her travels through Oregon, she visited a gift shop where she discovered the amazing art of Dean Crouser. She sent me a photo of a wall of his artwork with a friendly “challenge” to create a similar piece for her. So here is my attempt. It was fun creating it with the love I feel for this special friend. And though it is nowhere near the artistic genius of Dean Crouser, I’m hoping she will love it since it was made especially for her full of love and admiration and gratitude for her friendship. Love humming birds and this one is lovely!! Especially knowing the story behind it! I hope your friend enjoys her well deserved vacation! So colourful & lovely Jodi! It’s beautiful! I love the color palette, and loose style of painting. Thanks deborah. It was funnnnn! Absolutely stunningly beautiful!!! I’m sure she will LOVE it! Jodi, it truly is wonderful! I wanted to let you know that I will be visiting my children and grandchildren the rest of this week and next week so don’t worry when you don’t see me on your blog for awhile. Jodi, this is gorgeous!! you captured Dean’s style beautifully! 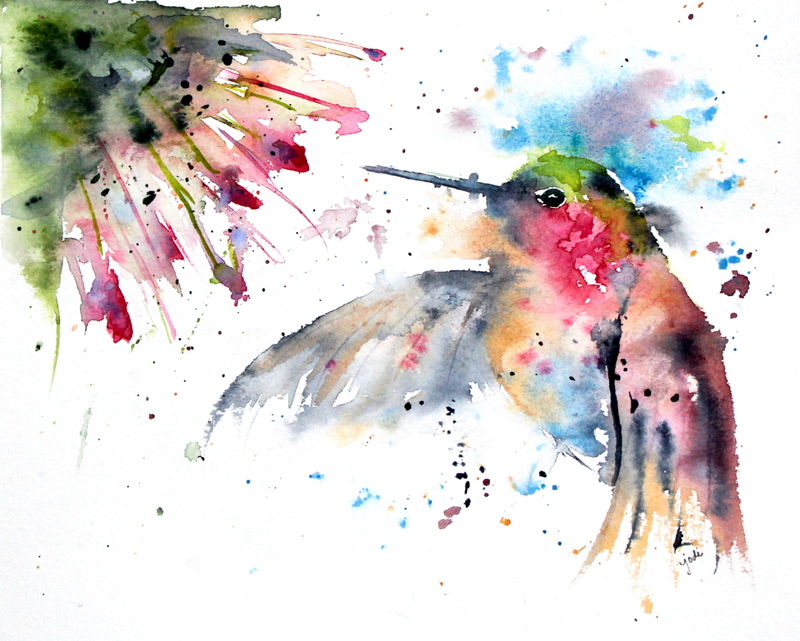 The hummingbird is such a perfect subject for this art style, as they are in perpetual movement! Your friend is going to be THRILLED!! Awh thanks Jenna!! It was so fun to do. Your talents are so varied! Lovely water color for your friend. Sweet. Jodi great courage to just attempt to paint in Dean’s style. Turned out lovely. My local art store is a Hallmark and art store, and they too carry many of his pieces in pottery, notebooks, plates, sugar creamer candle coffee mugs. I have a piece or two in the butterfly. My favorite style of painting. Yours is stunning and looks fun to do. I love his style too! I’ll have to see his butterflies.